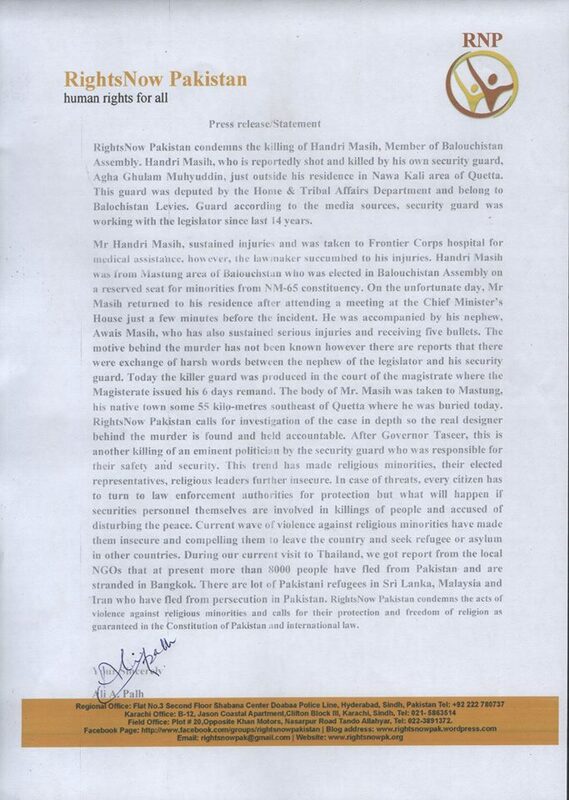 RightsNow Pakistan condemns the killing of Handri Masih, Member of Balouchistan Assembly. Handri Masih, who is reportedly shot and killed by his own security guard, Agha Ghulam Muhyuddin, just outside his residence in Nawa Kali area of Quetta. 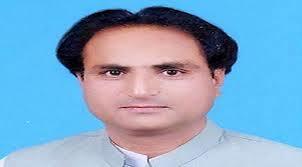 This guard was deputed by the Home & Tribal Affairs Department and belong to Balochistan Levies. Guard according to the media sources, security guard was working with the legislator since last 14 years. Details of the incident: Mr Handri Masih, sustained injuries and was taken to Frontier Corps hospital for medical assistance, however, the lawmaker succumbed to his injuries. Handri Masih was from Mastung area of Balouchstan who was elected in Balouchistan Assembly on a reserved seat for minorities from NM-65 constituency. On the unfortunate day, Mr Masih returned to his residence after attending a meeting at the Chief Minister’s House just a few minutes before the incident. 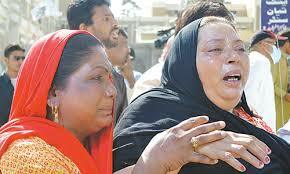 He was accompanied by his nephew, Awais Masih, who has also sustained serious injuries and receiving five bullets. The motive behind the murder has not been known however there are reports that there were exchange of harsh words between the nephew of the legislator and his security guard. Today the killer guard was produced in the court of the magistrate where the Magisterate issued his 6 days remand. The body of Mr. Masih was taken to Mastung, his native town some 55 kilo-metres southeast of Quetta where he was buried today. RightsNow Pakistan calls for investigation of the case in depth so the real designer behind the murder is found and held accountable. After Governor Taseer, this is another killing of an eminent politician by the security guard who was responsible for their safety and security. This trend has made religious minorities, their elected representatives, religious leaders further insecure. In case of threats, every citizen has to turn to law enforcement authorities for protection but what will happen if securities personnel themselves are involved in killings of people and accused of disturbing the peace. Current wave of violence against religious minorities have made them insecure and compelling them to leave the country and seek refugee or asylum in other countries. During our current visit to Thailand, we got report from the local NGOs that at present more than 8000 people have fled from Pakistan and are stranded in Bangkok. There are lot of Pakistani refugees in Sri Lanka, Malaysia and Iran who have fled from persecution in Pakistan. RightsNow Pakistan condemns the acts of violence against religious minorities and calls for their protection and freedom of religion as guaranteed in the Constitution of Pakistan and international law.